This is a famous Andhra delicacy made with pure ghee. These are very easy to prepare and taste superbly delicious. Urad Dal is considered to give strength to the backbone. Dry roast urad dal on a med-low flame until it turns golden brown in color. Then transfer to a plate and allow it to cool down. Later grind the dal into a fine powder, add cardamom seeds if using and keep aside. Also powder sugar finely and mix with powdered dal. Melt ghee and pour this hot ghee on top of the urad dal mixture. Mix well with hand (yes, you can handle it) until ghee mixes well with the dal mixture. Don’t let the mixture stand for a long time as it tends to dry soon. Take small portions of the mixture and shape into balls. Arrange them on a plate to dry for some time and enjoy the tastiness of these aromatic laddus. Uma, the ladoos look so delicious..very new to me..thanks for sharing..beautiful click dear.. Similar to maaladu... Should try this. Looks delicious. Wow! Love this ladoos! Beautiful clicks. Woww laddoos looks super cute and healthy..
Wooow My favorite looks so tempting Uma yummmm. I tried this long time back.thnx for reminding me.must prepare again.. I've never had urad dal ladoos...looks really tempting! Seeing the make me reminds me of home, mom used to make this a lot as atreat for us when we were back from school. WIsh i could grab one. Laddos looks so delicious..cute round laddos. never had any dal laddos before...these looks perfect n delicious...so tempting! I adore these laddoos!! WIll make them in winter though!! 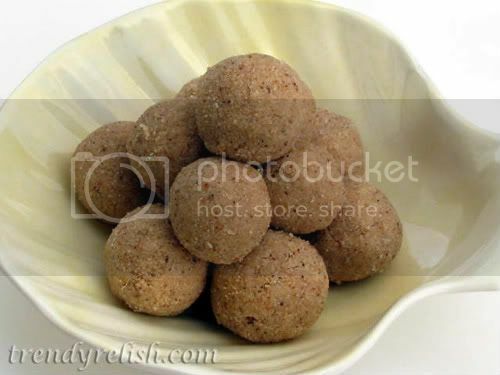 Love Urad Dal Ladoos..Never tried making at home though :) Can i use readymade Urad dal powder? I never tried with black gram, should be a tasty and healthy ladoos! really are one of the nutritious sweets from Andhra.